Please note that our Day of the Dinosaurs field trip is no longer offered because Science Partners was banned from Dinosaur World! See information at the bottom of the page. Join the Cliftons as we journey back in time to the days when dinosaurs walked with man. We'll dig for the truth in Mulberry, located in Florida's "Bone Valley" and known for its phosphate mining industry. We'll spend the morning studying dinosaurs. We'll find out if dinosaurs are mentioned in the Bible (and were any ever found in Florida), learn how fossils are made, and even see real fossils and a scale model of Noah's Ark. We will learn how the worldwide flood affected Florida’s past by fossilizing the remains of sea and land animals and plants. 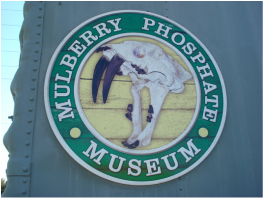 In the afternoon we'll visit Mulberry Phosphate Museum. The exhibits in the main gallery represent Florida's past. We will see a variety fossilized remains and models of many animals that lived in Florida long ago and were actually found in central Florida. Bring along a small spade to use on our fossil dig outside the museum where we will search for shark’s teeth and other small fossils that we can keep! We have also found fossilized shells, fish vertebra, camel teeth, alligator teeth, bison teeth, stingray scales and mouthplates, and more! The Cliftons will provide sifting baskets and fossil ID charts as well as extra spades and digging tools if you don't have any. The phosphate museum is closed on Mondays, so this Creation Adventure may be scheduled on another day of the week. $18 per person (3 years through adult). Tolls: If you travel on the Polk Parkway, the cost is approximately $3.00 round trip from Orlando area (depending on how you travel home). The phosphate museum is closed on Mondays, so this Creation Adventure may be scheduled Tuesday through Friday. To visit our web calendar and check for available dates or scheduled trips, click here. Some other guests and school field trips have mistaken our tour to be a part of the Dinosaur World experience and this may “cause some confusion and misunderstanding about what to expect on a visit to Dinosaur World.” They also noted that we don’t do Dinosaur World’s fossil dig (they know that we dig at Mulberry Phosphate Museum in the afternoon) and that we don’t participate in their Exploration Cave Show or Triviasaurus Rex game show which they “feel adds value to our guest’s visit.” That’s like saying we can’t go to SeaWorld unless we go to every show or ride Kracken, etc. Those were all their “reasons” for basically banning us from Dinosaur World. We know that they are very evolution oriented, and they know that we reinterpret dinosaurs, fossils, etc. from a biblical, creation viewpoint for our groups. We feel that the real reason is that they don’t want to tolerate our creation viewpoint any longer.